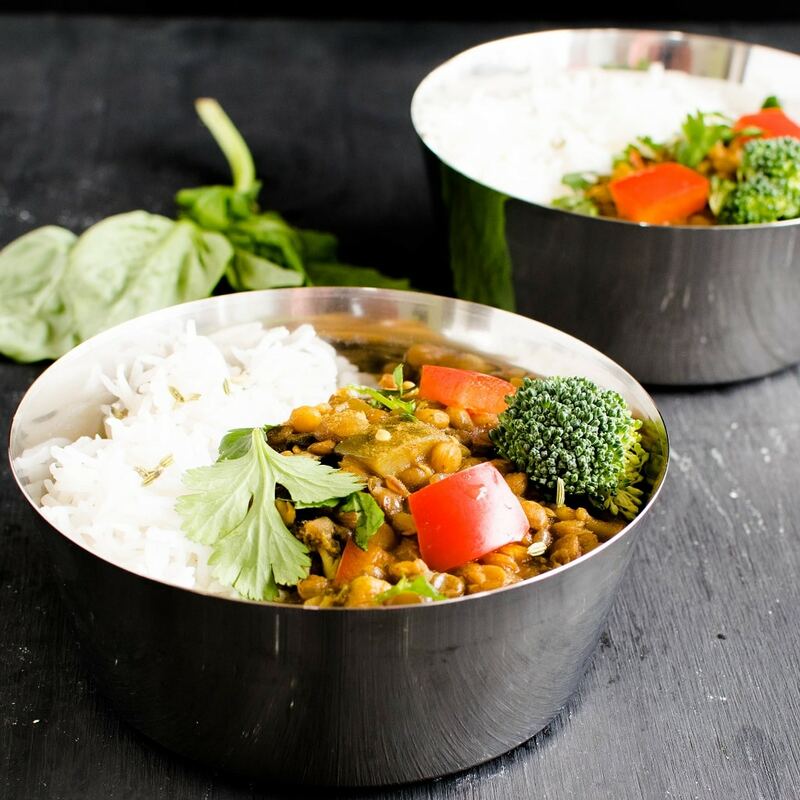 As the name suggests Instant Pot Herbed Masala Lentil Curry is a flavorful protein packed entrée. I adapted it from my very own recipe Basil Vegetable Lentil Curry from my blog. It’s quite a popular recipe and now I decided to post instant pot version of it with little tweaks. This masala lentil curry is a medley of Indian spices and some fresh herbs. It’s aromatic and absolutely inviting. Also, it pairs well with naan/ jeera rice/ steamed quinoa. It’s a wholesome meal packed with a balanced nutrition. 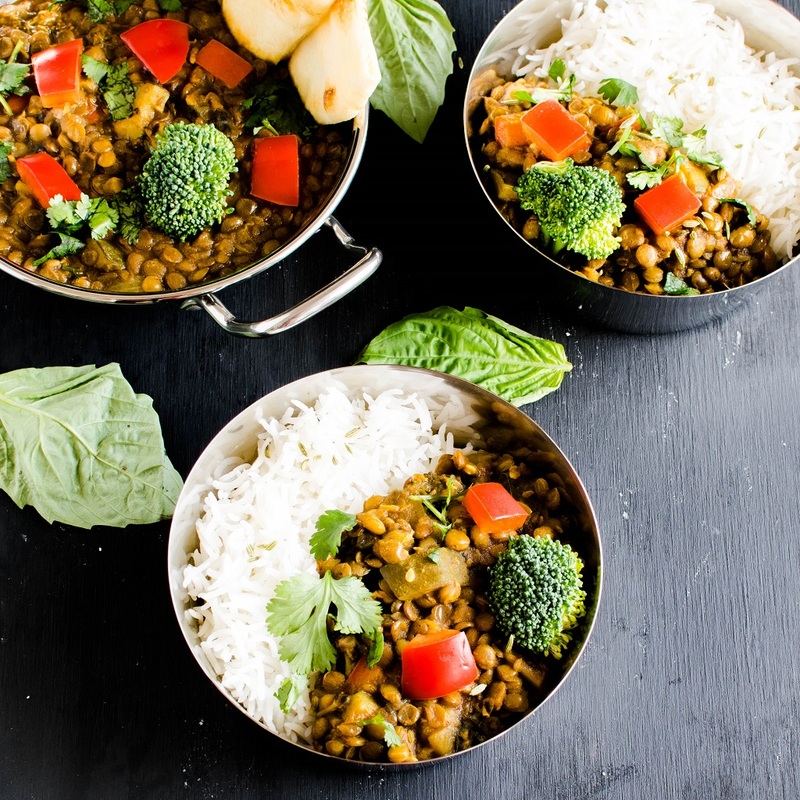 Each and every spice flavors this lentil curry amazingly. Even though I used the same vegetables as my previous blog pot I made quite a bit of changes with the spices. I think it turned out to be more exquisitely tasteful. In addition to all the deliciousness instant pot makes it even more hassle free and easy to cook. Simply just throw in the ingredients in the pressure cooker and let it work. By the end of it you have minimum dishes to wash and minimum cleaning required. The best part of this recipe is that it’s a make – ahead entrée and stays fresh in the refrigerator for up to a week. This beautifully packed Instant Post Herbed Masala Lentil Curry reheats perfectly. It tastes the same even if you reheat it after 2-3 days. Instant Pot Herbed Masala Lentil Curry is satisfying, healthy, nutritious and a complete dinner. The leftovers is a perfect lunch box idea for the next day. I used the vegetables that were handy in my refrigerator. However you may use your choice of vegetables and make it as creative as possible. Of course we need lentils for this lentil curry so I used green lentils. 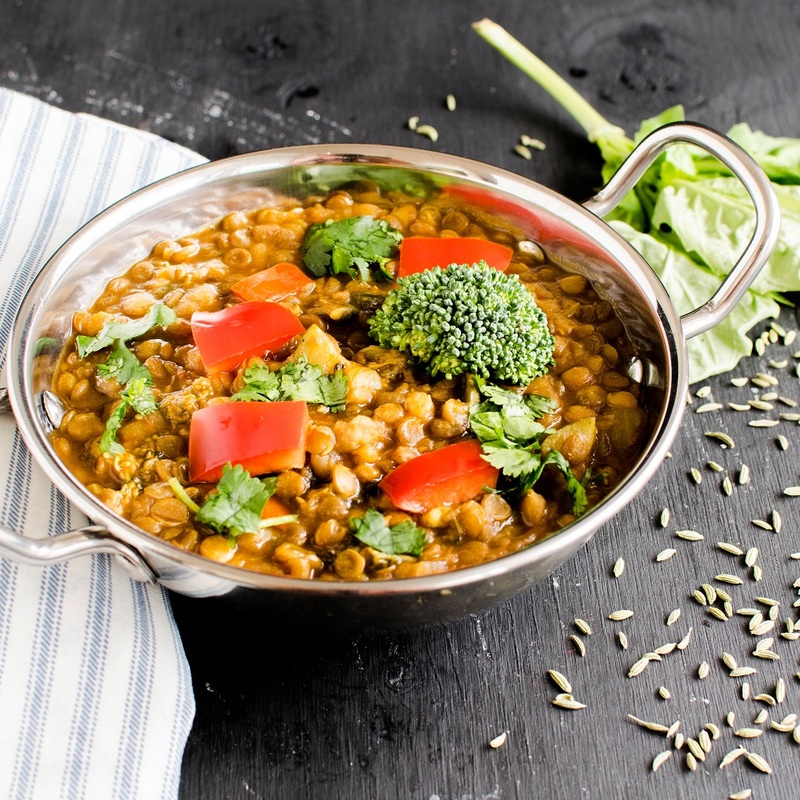 I love the cooked green lentils because of its thick texture and smooth taste. Overall this lentil curry is versatile, scrumptious and fiber rich as well. It’s the best entrée I can imagine for all seasons and all year round. Instant Pot Herbed Masala Lentil Curry is a flavorful protein packed entree. Its a medley of Indian spices and fresh herbs. All it needs is one pressure cooker and 30 minutes. Add olive oil to your instant post and set it to saute function. Then adjust its temperature to normal/medium. Then, add garlic, ginger, asafetida, cumin seeds and fennel seeds. Next, mix it well in the oil. As soon you hear the sizzle add onion and saute for 30 seconds. Then, add tomato paste and saute again for 30 seconds. Now, add zucchini, broccoli, red bell pepper and saute again for 30 seconds. Later, fold in green lentils and mix it with a spoon. If you think the masala is sticking then cancel the setting of your instant post and add rest of ingredients to it. Or else let it be at the saute function while you add the rest of the ingredients. Cover the lid of the instant pot and close the whistle. Thereafter, change the setting of instant post to beans/chili and let it cook in the normal/medium mode. Once your instant post beeps release the whistle. Once the valve is ready to open pull out the lid and enjoy it warm with steamed rice/quinoa or naan with a side salad. this actually made my mouth water! Now I just need to get an instant pot! I cannot wait to try this recipe! Go for it now. You will enjoy instant pot. I love using the pressure cooker. This recipe looks like a great way to put it to use! You must try this lentil recipe. My family loves it and its regular in my home. This looks incredible! I haven’t jumped on the instant pot bandwagon yet but I think I just might! Yum! I would highly recommend on investing on one and start with delicious recipes henceforth. I love all kinds of curry, so this is right up my alley! These recipes look amazing! I’ve been on the fence about getting an Instant Pot, but the more I see of these healthy, delicious looking dishes, I’ve decided I need one in my life! I use my instant pot at least 3x/week. This recipe sounds so good – I’ll have to try it! I love pretty much anything with curry! Yum! Looks so yummy. I think I am going to have to try this!! I’ve been searching for delicious new recipes to try out making in my Instant Pot. 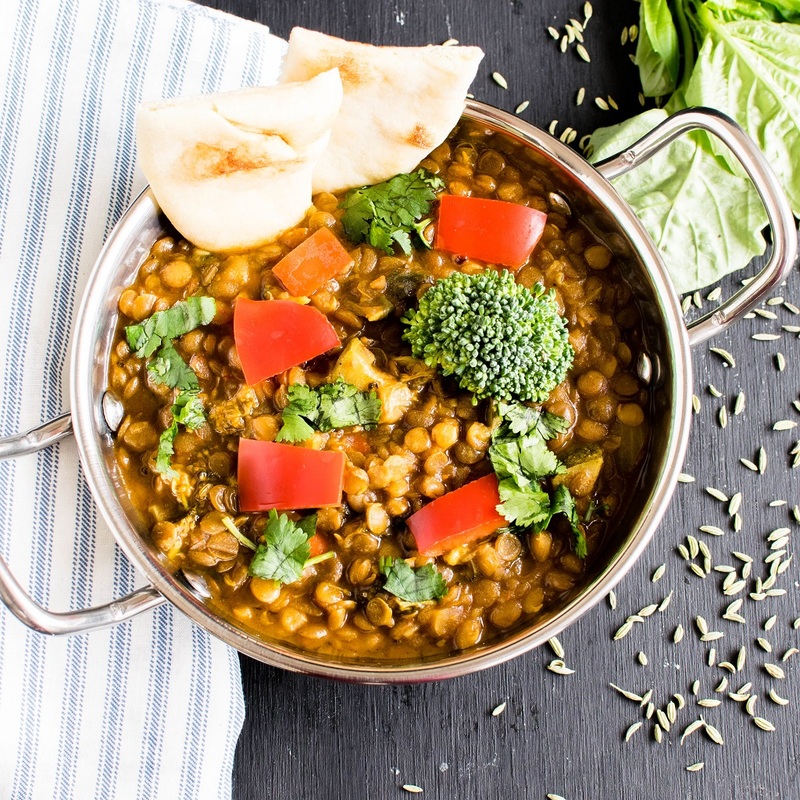 This Masala Lentil Curry looks absolutely divine. I can hardly wait to go grocery shopping for all the ingredients. My kitchen is going to smell amazing, and my tastebuds will be dancing!